CMDB Implementation is one of the most complicated of any ITSM programmes an organisation can undertake. The difficulties in creating a toolset, capable of linking hundreds of thousands of interconnected bits of data together in a meaningful manner while also supporting a highly fluid environment with dozens of changes each week, are formidable indeed. 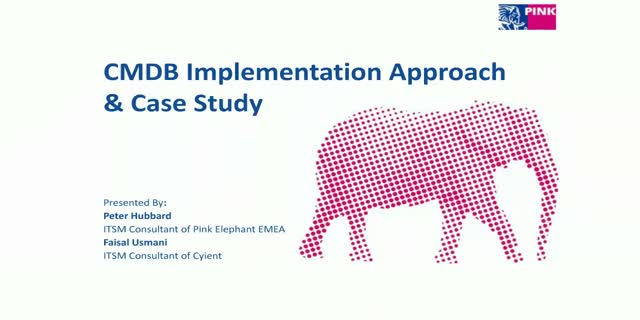 Join Peter Hubbard, Principal ITSM Consultant at Pink Elephant EMEA, as he discusses the Pink Elephant approach to create a CMDB in the real world. He will demonstrate the critical importance of the scoping session and understanding the organisations requirements to ensure the CMDB supports the business. Peter will then show you how to turn those requirements into concrete actions to map and create your CMDB. Faisal Usmani, Business Development and Strategy Lead for Comms at Cyient EMEA, will build on Peter’s theme; detailing how an effective CMDB implementation forms the basis for ITSM solutions. He will cite a case study that shows how this translates into a real world operational scenario that utilises actionable dashboards and provide valuable insights into your service performance at different levels within your organisation. Enterprises traditionally offered services in a daylight cycle that allowed their internal IT to follow a similar supportive operational alignment. IT has used the Service Desk as a Single Point of Contact to act as the IT interface to Business and its customers, with a linked business hours offering. Customer demands of the business have changed with many enterprises extending services and product support to an “always available” offering that moves the Service Desk from a weekday 6-till-6 to 24/7. This extension of the Service Desk operational hours has many challenges to be dealt with and decisions requiring answers. Join Graham Herbert from Pink Elephant as he walks us through how to gear up to this challenge and look at what decision points will have to be dealt with in order to move to 24/7 Service Desk support. CMDB Implementation is one of the most complicated of any ITSM programmes an organisation can undertake. The difficulties in creating a toolset, capable of linking hundreds of thousands of interconnected bits of data together in a meaningful manner while also supporting a highly fluid environment with dozens of changes each week, are formidable indeed and that does not even count the ongoing workload of keeping the records up to date once the toolset has been created. Join Peter Hubbard, Principal ITSM Consultant at Pink Elephant EMEA and Paul Yates, Senior Technical Consultant at FireScope, as they discuss creating a CMDB in the real world in 2019. In IT there are only 3 times that the business will notice us. When its new, when the bill comes due and when it's broken! As statistically speaking its most likely to break when its new there is a good chance that most of your high-pressure interactions with the business will be when something is broken! The way in which an IT department handles its response to a major incident is critical and poor communication, slow response and lack of updates are all major issues that cause friction between IT and the business at these critical times. Join Peter Hubbard from Pink Elephant as he walks us through how to create a Major Incident process, the dos and don'ts of how to manage them and uses a case study of a real-world major incident response to illustrate the learning that can happen. After all, no organisation should waste a good disaster! For decades, the goal of Incident Response in IT has been increased user productivity. Get them back up and running as fast as possible. But, truthfully, Incident Management is usually more of a band-aid than a cure. We know how to eliminate existing incidents using root cause analysis & Kaizen. We know how to reduce incidents up front by improving the quality of changes. But what IT still struggles with is cyber or security-related incidents. Most service desks function as the frontline reporting structure for ALL types of incidents, but without a specific process for handling security issues. With over 50% of large IT enterprises using or intending to use, a DevOps approach in the next year, less than half of those already using DevOps report any level of success. When asked to identify the biggest obstacle to adopting DevOps, most cite “people” challenges – as opposed to process, technology or information – as the greatest issue. Provides new practices that can be executed with immediate effect. ITSM tools are replaced too frequently because buyers fail to gain the expected benefits. This is because the buying selection process is ill-considered. In this vendor neutral session, Eddie Potts references his experience working with businesses and multiple platforms to prove why the flawed buying process is a major reason why ROI is not achieved. In this conversational webinar, Pink Elephant’s Peter Hubbard and G2G3’s Aidan Hewitt explore the challenges faced by Industry today when it comes to education and team building in IT teams. •Help your customer to deliver results, faster, improved customer satisfaction and increased revenues. Join Peter Hubbard a Principle ITSM Consultant at Pink Elephant and Mark O'Loughlin the Managing Director of the Cloud Credential Council as they explore how ITSM is affected by cloud computing. Cloud computing brings many business benefits ranging from increased cost efficiencies, business agility, improved use of resources, reduction of operational issues and capital expense but it also brings many challenges to address. How can ITSM ensure that cloud services are managed and deliver real business benefit for their organisations? Successful cloud adoption can enhance economic growth and have significant industry impact across the economy, but unsuccessful cloud adoption can open the organisation up to potential data breeches, cloud sprawl and loss of control. In this webinar Peter and Mark will discuss how to avoid the lack of control that blights many cloud adoptions in the digital era. In 2007, the IT department of AutoTrader was at the lowest of the low, untrusted and not seen as a true partner to the business. As the organisation transitioned from a brick and mortar printing organisation to an online digital organisation, they needed their IT department to step up and deliver more reliable and better-aligned IT services, while the rate of change would double and then double again. During this session, Dave will translate theory into practice and show how the IT department moved from a traditional ITSM implementation based on traditional ITIL to one that blends DevOps, Lean IT and ITIL together. He will discuss the bumps encountered along the way and how they were overcome. The IT department is now seen as a trusted business partner and has been invited to assist in major business improvement initiatives as the organisation hopes to replicate their internal successes for the business as a whole. As our industry transforms and matures, last century standards for cross-team communication become less and less efficient. And in today’s digital world, the tiniest technical glitch can have huge consequences—requiring swift and flawless communication. Whether it’s a datacenter outage, a cyber-attack, an application failure, or a manmade issue, they’re all critical events which support centers need to identify, categorize, and help coordinate cross-functional teams for timely restoration. Today, there’s an area where the role of the service desk continues to become more and more strategic when it comes to communication: Critical event management. So when IT hits the fan, will you be prepared to manage critical events? Are you using the right tools? Are you meeting your SLAs and complying with regulations? In this conversational webinar, Pink Elephant’s Peter Hubbard and Everbridge’s Mike Beckett explore the challenges faced by modern team structures when it comes to interrupted or complex coordination during unexpected IT downtime events. Everyone’s talking about it!! Are you prepared for GDPR? Do you have the proper standards, processes, and tools in place to keep sensitive customer data safe, even when new software vulnerabilities emerge? Join Helen Windle who will talk you through the evolution of Data Security, where we are now and the impact that GDPR will have on many organisations. You will also get to understand the critical aspects of GDPR and discover the key steps you should take to ensure your business is prepared to support your GDPR initiatives and maintain compliance. DevOps is recognised as a new way of working within IT departments. But what, exactly, is it? Where did it come from? Why is it being talked about more and more? Who is using it? Does it really work? How do I know if I am ‘doing DevOps’? Why would I even want to do it? Join Peter Hubbard, Principal Consultant from Pink Elephant EMEA Ltd as he provides an overview of DevOps – the basics. Pink Elephant have years of experience in assisting organisations with the selection, implementation, review of Service Request Catalogues. Common themes have become apparent during such engagements, and the purpose of this webinar is to share this knowledge and practical advice for organisations seeking to implement Service Request Catalogues. Lean has much to offer the strategic thinkers of the IT Department. In this webinar Peter Hubbard will be showing how Lean IT principles can help senior IT Management in 3 core areas. Many companies see the future in automated service, yet wonder where to start. The Service Automation Framework provides some easy-to-understand models that everyone can used to start the design and delivery of automated services. Used by many organisations around the world, it provides tools and techniques to achieve service automation. In this BrightTalk webinar, we will focus on the technique of service automation blueprinting - a workshops approach for the the design of automated services. We will discuss the theory of the Service Automation Blueprint and will subsequently apply the techniques to a real world University case to make it as practical as possible. Don't miss this chance to learn more about Service Automation Blueprinting. LEAN IT is one of the current buzzwords that swirls about our industry, but what is it? How is it different from ITIL or DevOps? And which is better anyway? How do I know when I am being LEAN and what benefits could it bring to my organisation? Join Peter Hubbard from Pink Elephant as he provides an easy to understand primer to LEAN IT complete with some practical guidance on where it could help and what to do about it. Our globally connected world delivers a wealth of opportunities for economic growth and innovation but it also brings with it the real risk of cyber-attack. Many organizations continue to invest in multiple layers of ‘intelligent’ technical controls to protect themselves from cyber attackers. However, security breaches continue to grow in their scale and impact. There’s something missing in our organisational response to the cyber risks we face. Effective cyber resilience need to focus on aligning strategic priorities, service management tools, operational systems and architectures with ongoing training and involvement of people across the organization. By applying these proven disciplines organizations can more effectively balance their business opportunities and risks, their people, processes and technology and their ability to prevent, detect and respond to cyber-attacks. This webinar will outline the cyber resilience challenges and the opportunities open to organizations and how RESILIA™ best practice can be used to build the critical collaboration between ITSM and InfoSec teams needed to effectively manage and respond to the cyber risks they face. General Manager of RESILIA at AXELOS where he’s responsible for leading the successful design, development and demand of the RESILIA portfolio that provides cyber resilience best practice, training, learning and insight for organisations from the boardroom down. Previous to AXELOS Nick spent 11 years at Detica (now BAE Systems Applied Intelligence) where he helped set up their Cyber Security business and led their cyber market engagement and thought leadership. An expert in information security management and IT service management. He works with IT organizations all over the world, helping them create value for their customers. Stuart is an author of ITIL® and RESILIA™ and blogs at optimalservicemanagement.com. He is chief examiner for RESILIA, and an examiner for ITIL. Join Michael Harris on how to build the right high performing teams to meet demand - it’s all about people - How do we make the corporate machine value that and attract, inspire, unlock the potential of and retain, the right people? He has a unique combination of leadership, industry, coaching and transformational experience. His passion is helping organisations, and individuals, shape and build their future. In a career spanning over 30 years, Michael has worked in Financial Services, Manufacturing, Telecoms, Government and as a freelance consultant. In this engaging webinar hosted by both Pink Elephant UK and North America we will look at these two trends. •Service Integration & Management (SIAM) – building a “One Team” delivery approach. Service Automation is the concept of achieving customer loyalty by the use of automated technologies, and it builds upon large demographic and sociological trends. As a society, we have become accustomed to arranging our lives online and expect services that can match those expectations. Service Automation helps to arrange our lives online. This session will bring you up to speed on Service Automation, the concept by which you can automate your service offering. The Service Automation Framework defines a methodical way to discuss Service Automation and provides a step-by-step approach, including a number of design elements and processes, which every organisation can use to systematically enhance its services. Pink Elephant is an international business innovator and knowledge leader in the field of business transformation. With IT and consulting services, Pink Elephant enables clients to translate knowledge and creativity within their organisation into results. Beginning with its foundation in 1980, Pink Elephant has perceived the synergy between man and IT as the most important tool for businesses to innovate and increase their competitive advantage. Pink Elephant is active in more than 20 countries and alongside business and management consultancy also provides Enterprise App Services, IT Services, and Education Services.